Who Wins and Who Loses With the Supreme Court's Gene Patenting Decision? A US Supreme Court ruling issued Thursday has big implications for Bay Area biotech companies and medical researchers, not to mention patients who want genetic testing or gene-based therapies. 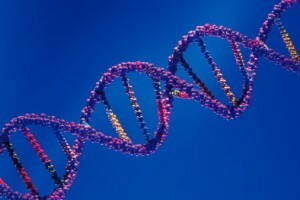 The justices ruled that no one has the right to patent natural human genes, but synthetic DNA material can be patented. KQED News anchor Stephanie Martin spoke with Jacob Sherkow, a fellow at the Center for Law and the Biosciences at Stanford who studies the intersection of patent law and biotech. Stephanie Martin: Let’s talk first about what the court means by naturally occurring genetic material. What does that cover? Jacob Sherkow: It’s referring to human genes as they exist in the human chromosome. So, one of the things that Myriad attempted to patent was isolated genomic DNA. That is, those genes as they exist in human chromosomes, except as if they were cut out using a pair of molecular scissors. SM: And we should mention that Myriad is the Utah-based company at the center of the case. JS: Right, sorry. Myriad Genetics. SM: And very briefly, what is the difference between synthetic DNA and naturally occurring DNA? JS: So the type of synthetic DNA that the court was concerned with was something called cDNA, which stands for either complementary DNA or clone DNA. cDNA is a variant of the isolated genomic DNA that we just talked about. The major difference, however, is that all of the regions of the isolated genomic DNA that do not code for protein have been removed. So if you can imagine a sentence, for example, and if you were to remove all of the less meaningful words from it and creating a new sentence with only the meaningful ones, that’s kind of what cDNA is. SM: So there are a lot of biotech companies and universities in the Bay Area who own patents on both of these types of DNA. Who wins and who loses with today’s decision? JS: That’s actually a really difficult question to answer. I think in the biotech industry, you know, here in the Bay Area and around the country, you’re going to get a mixed bag of responses. There are going to be some companies that are going to laud the ability to get into this gene marketing space without having to be worried if they’re going to be sued for patent infringement. And you have some other companies that are going to be concerned that without patent protection to certain genes it’s going to be difficult for them to recoup the investments that they put in creating their technologies, and also to get funding as they move forward in their product life cycle. SM: Now patient advocates are claiming this as a victory, because they say that it’s a big win for competition in the marketplace and access to perhaps cheaper, and perhaps better, gene testing therapy in the future. But isn’t there also an argument that this ruling might hurt patients, because getting patents on naturally occurring genes, was there was a financial incentive behind it? JS: So that’s actually a greater argument about the patent system. It takes a lot of research and time to be able to figure out which genes implicate which diseases, and which mutations in those genes have which effects. And the way that companies have traditionally been able to recoup those costs is by getting patents and by excluding other companies from the marketplace. And so the reality is that without some type of exclusionary system, like the patent system, it’s possible that we may see less research and development in the future in this space. SM: Is there an argument that this Supreme Court ruling might put a damper on innovation? JS: So I think it’s possible, but I think the on-the-ground reality is that because a lot of this work is funded publically by organizations such as the National Institute of Health, that we’re really not going to see this dampening on innovation that people have been saying that there’s going to be. Michael Osborne contributed to this article.